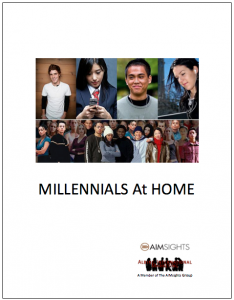 MILLENNALS At HOME…IN THE KITCHEN Report. 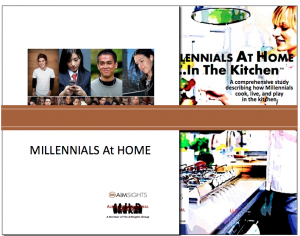 MILLENNIALS At HOME…In The Kitchen is the follow-up to “landmark” MILLENNIALS At Home from The AIMsights Group. MILLENNIALS At HOME discovered that the feature Millennials desired most in their future dream homes wa a “fabulous” kitchen, trumping all size/prestige/luxury factors. So it was clear that the space required further, in-depth study. 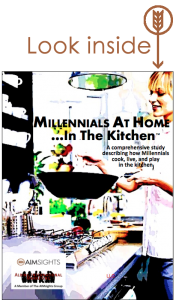 MILLENNIALS At HOME…IN THE KITCHEN builds upon the key trends in MILLENNIALS At HOME and examining how they impact their preferences for the “hub of the home”: the kitchen.